This week's assembly was jam packed with exciting events. First off some children came to school dressed in clothes of the profession that they would like to do when they grow up. We had policemen, nurses, a gardener and a pilot! The children described what their job would be and Ms Rojena helped to explain in arabic. We also were delighted to have our second brave parent in to talk to us about their job. A mother from Ms Caron's class is an art teacher in a kindergarten school. She explained the things that she likes and dislikes about her job and what her daily routine is like. It was obvious that a lot of the students in the audience were inspired by her and may grow up to become art teachers too! Ms Martina and Mr John also had some exciting news as they announced the winners of the Little Scientist Fair. Everyone who participated received a certificate-you all did a great job-well done everyone! This morning Ms Martina's students asked a lot of tricky questions to all of Grade 1, but because we have such incredible students, they were able to answer all of the questions and prove what great thinkers they are! The Grade 1 children are currently learning about their new central idea: People choose jobs to meet their needs and wants. This morning one of our risk taking parents came in to talk to our students about her job-she is a dentist. She told us all about what she does and showed us some of the instruments that she uses to help people look after their teeth. It was a great assembly and we all learned a lot. Congratulations to all of our fantastic certificate winners too who have shown their great thinking skills at school this week! We had a double celebration this morning in Grade 1 ! Ms Khitam and Ms Rojeena awarded our amazing students with certificates for their fantastic participation in the Islamic Competition held at our school recently. Ms Josephine's class then shared with us what they have been inquiring into over the last week and everyone loved their beautiful pictures of the sun , moon and planets. Congratulations to all of our super inquiring students! This morning Ms Alexis's class shared with us all of the action that they have taken during their current How the world works unit. They made wonderful models and drawings to explain their understanding of the earth's cycles. They also created their own song about action and performed it at assembly. Well done everyone, you were fantastic! Congratulations to all of our Grade 1 students who took action-you really are becoming amazingly independent learners! Ms Denise's class talked to us about how they used their skills to learn all about the earth's cycles. They showed us lots of examples of their work to help us to understand what they did. Congratulations to them and to all of our award recipients this week. you are a very skilled bunch of kids! Today Ms Hope's students taught us all about cooperation. Each student drew a picture of how they are cooperative, either at home or in school. Great job everyone and well done to all of our grade 1 students who received certificates for showing cooperation at school! This morning Ms Shannin's class taught us all about being principled. They used incredibly loud voices and spoke very confidently. We learned how to always to the right thing. Congratulations to all of our worthy principled kids. Well done everyone! This morning Ms Brenda's class showed us lots of different ways that they have been making sounds through songs and rhymes. Her students were very good at showing how they can make tiny little sounds like mice and great big crashing sounds like a thunder storm. Well done everyone and to all of the wonderful grade 1 kids who took action during their last unit of inquiry! Grade 3 students also came to our assembly to tell the students about their upcoming Market day. It sounds like it's going to be very exciting! This morning in Grade 1, we were treated to a beautiful assembly in arabic lead by Ms Khitam and a mixture of students from across Grade 1. It was to explain their central idea about how important the sun is to us. 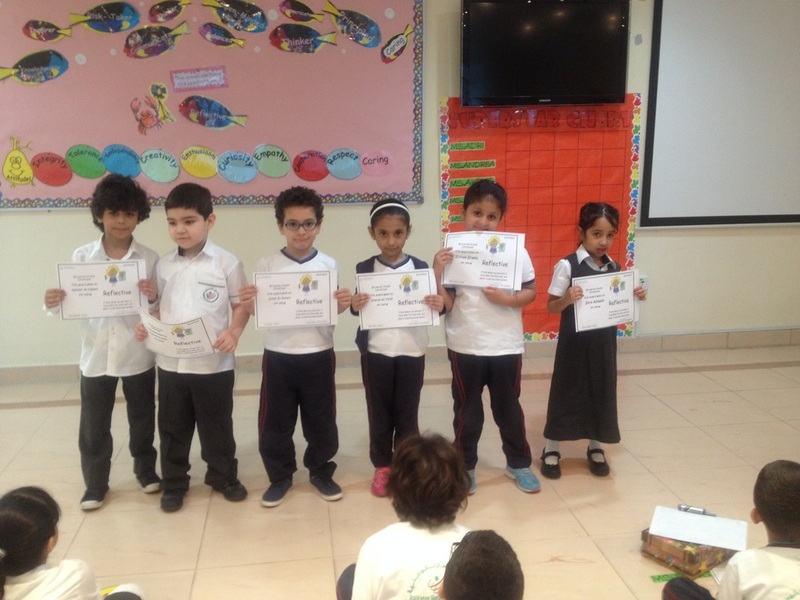 The Grade 1 children also received certificates for using research skills while finding about about their new unit How we express ourselves. Well done everyone! This morning, Ms Maura's class showed us their beautiful pictures of what they are enthusiastic about in their lives. Well done to all of our students who show enthusiasm and excitement for their learning both in school and at home. Great job everyone! Today Grade 1 were treated to a beautiful display of creativity from students in Ms Martina's class. The children were inquiring into famous landmarks connected to big cities and they each created their own version of the Burj Al Arab using different materials. Their ideas were amazing!!! Well done to all of our creative geniuses in Grade 1! This morning Ms Josephine and her class, taught us about being open-minded through the story of Yoko. Yoko liked eating sushi and her classmates didn't want to even try it so so Yoko's teacher held an International Food day, where all the students had to try something new. Ms Josephine's students drew wonderful pictures and wrote about what they understood from the story and how they are open-minded. Well done to all of our open-minded students in Grade 1, we can discover more about the world if we are open to trying new things! This morning Grade 1 students were showing used how knowledgeable they are in arabic. mabrook everyone-you did a great job! Ms Alexis' class were also sharing how they were learning in their class. You are all superstars!! Congratulations Grade 1! This week Ms Adri's students shared with us how they used their research skills during the last unit Sharing the Planet. Well done to all of our amazing inquiring students who found out lots of new and wonderful things about the ocean and how humans impact it. Well done to Ms Hope's class who shared their beautiful pictures and amazing ideas on how they show integrity at home with their families and in school with their teachers and friends. Congratulations to all of our fantastic students who are honest and trustworthy all the time-you are superstars! Today we were treated to a beautiful song, written and composed by Ms Caron's class. It was all about appreciation, how we can value kind acts that people do by saying thank you. We also learned that to appreciate means to recognize the full worth of something so we take care of it. Ms Caron's class taught us how to say "thank you" in 13 different languages-so now we can appreciate people all over the world! Congratulations to all of our amazingly appreciative students-well done everyone! Well done to all of our principled kids today for "doing the right thing"! A big thank you to Ms Brenda's kids who shared how her children were principled throughout the last week. Great job everyone! This morning Ms Maura's class shared with us the action that they had taken over the course of their last unit- Who We Are. They brought photographs to school to show their classmates. Some children were recycling clothes in the community, others were picking up rubbish and some were helping their brothers and sisters. Well done to all of our Grade 1 students for helping to make our world a better place by taking action! Grade 1 were showing us what great communicators they are today by sharing their ideas. Ms Martina's class wrote and illustrated their ideas about their unit and then presented them to the whole grade at assembly. Great job everyone! Congratulations to all of our amazing reflective students who think about the world, their own ideas and experiences. They've worked to understand their strengths and weaknesses to help their learning and development. Today was a very exciting assembly as we had a film crew recording us! They filmed us singing the national anthem and walking to our classes. Ms Alexis and her class talked to us about what it means to be an inquirer. All of her students came up with questions for Ms Brenda as she has taught in a different school community in Uganda. The students were finding out how communities are different and alike in their Who we Are unit of inquiry. Well done everyone for being super inquirers! Well done to all Grade 1 students for being caring this week both in school and at home. Ms Andrea's class showed us their beautiful drawings and explained to us how they were caring. Great job everyone! 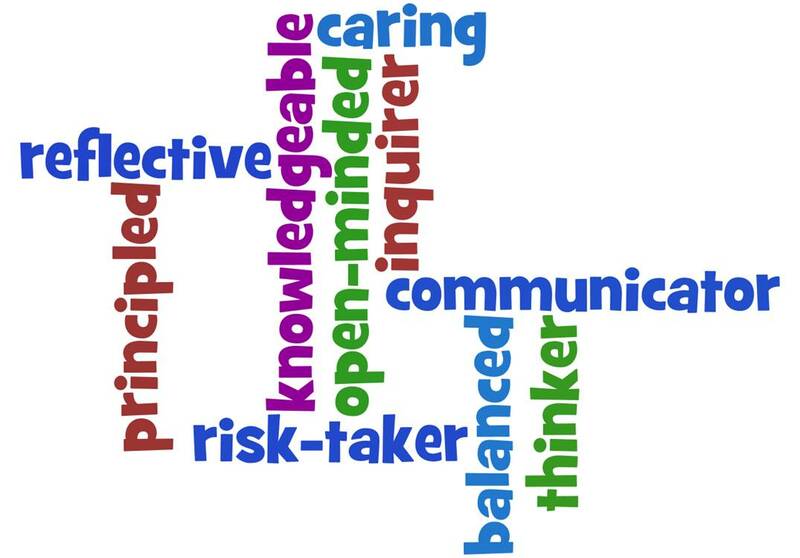 Communicators: We express ourselves confidently and creatively in more than one language and in many ways. We collaborate effectively, listening carefully to the perspectives of other individuals and groups. Caring: We show empathy, compassion and respect. We have a commitment to service, and we act to make a positive difference in the lives of others and in the world around us. Balanced: We understand the importance of balancing different aspects of our lives-intellectual, physical and emotional-to achieve well-being for ourselves and others. we recognize our interdependence with other people and with the world in which we live.